What follows is based on my experience whilst being treated by the UK NHS as both in-patient and outpatient. My treatment is mainly under gastroenterologists but I also encounter haematologists, hepatologists, colorectal surgeons and upper GI surgeons. The dynamics described here may be different if you are funding your healthcare privately and paying a consultant directly or via an insurance company. With the NHS coming under increased pressure from ever rising demand, I believe that we can, as patients, help to make a difference by using the resources availble to us as efficiently as possible. These resources include our consultant’s time, tests, procedures, etc. By “MY HEALTH” I mean both my physical and mental well being and the effect my conditions have on my QOL, work and chosen lifestyle. 1) Making Lists – Definitely in the “blindingly obvious” category. This has to be the best thing I’ve ever started doing. I used to go into the consulting room with the attitude “of course I’ll remember all the things I want to ask.” It was a male arrogance thing. I’d then arrive home and my wife would say “and what about x?” Blank stare. “Why didn’t you write a list?” Another blank stare. This went on for many years (male arrogance is a long term condition) until the penny finally dropped. Nowadays I start preparing a list several days before the appointment date. 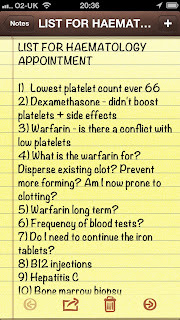 (The one shown below was compiled in preparation for seeing a haematologist prior to weighing up the advantages/disadvantages of starting Warfarin). Nowadays, I print out the list and make a point of having it in my hand as I enter the consulting room. After the initial pleasantries I explain that there are a number of questions I would like to get answered and point to the list. This sets the scene for what follows i.e. don’t expect to finish this consultation until we’ve been through it all. It is worth noting down the answers, although these should be covered in the follow-up letter that you get sent a few days later. (Or rather SHOULD be sent – more about that further on). Another advantage of having a paper list is that if you, at some point, become emotional or tongue tied you can hand it over and let the doctor work their way through it. The best way to approach this is to tell the nurse weighing you that you need to see a particular consultant and they can then put a note to that effect on the front of your file and make sure it gets put on the right pile. Occasionally it doesn’t work and you end up being called in by another doctor. At that point I politely explain that I’m not doubting their medical knowledge but I do need to see my usual doctor. This has always worked. If I’m just having a routine, follow-up appointment where no important decisions need to be made then I’m happy to see any of the doctors. I do question whether this type of appointment has any value and would be quite happy to do it by email, Skype or even an old fashioned telephone call. The only advantages of the face-to-face contact that I can think of is the doctor may spot something in your appearance or demeanour that you haven’t noticed or they might want to carry out a physical examination. When moving to a new consultant and/or hospital, or if you are unfortunate to have been admitted to a new hospital as an emergency, possibly unconscious, then a brief outline of your history can save a lot of time in the early stages of working out what has gone wrong and the best area to start investigations or treatment. For years I was always being asked when my first surgery was and what exactly the surgeon did. I knew it was an emergency admission to Croydon General Hospital sometime in 1979 (suspected appendicitis) and that it turned out to be a perforated bowel, but I couldn’t say whether any gut had been removed or if it had simply been repaired. It was only in 2011, when I obtained copies of all my medical records from Croydon Health Authority that I could finally give the definitive answer. 5) Contacting your consultant between appointments – Some consultants are happy for you to email them directly when you have a query or a problem or there may be a dedicated, condition specific, helpline that you can use as the first point of contact. It really does seem to vary. I have read of other patient’s experiences where the “patient confidentiality card” is played to avoid email contact. I’ve never come up against this. So far so good. Many hospital websites now clearly display the consultants contact details. This doesn’t come without some responsibility from the patient’s side. I make sure that I only contact the consultants directly if I have something that is urgent and only they can answer or they’ve asked me to report back about a problem. During 2012/3 I was being treated by three different disciplines so I usually copied any emails to all three consultants as it helped to maintain the co-ordinated care. It is worth keeping copies of the emails as I found out when I went to have a second bone marrow biopsy. The doctor performing the procedure was not aware that she needed to use a blood thinner to get usable samples (which is why I was having the second biopsy). I was able to show her, on my phone, the email trail that explained it all. This system of follow-up letters has always worked smoothly for me with gastroenterology and hepatology but then I came up against Haematology. The appointments were fine. Lots of good, open discussion but no follow-up letters. Four appointments and no follow-up letters. I did query this a number of times but still no letters, just apologies. A few months on and guess what, still no follow-up letters. In the end I looked up the name and email address of Haematology’s head of department. I contacted her, explaining the situation and suddenly I had four, retrospectively written, follow-up letters. 7) Manage Your Appointments 2 – er, haven’t we already done this one? Yes, but this is managing how the actual appointment goes. I’ve left this one almost until the last as it’s fairly new territory for me. I hope to develop the theme in the future to reinforce the notion that the patient should actively manage how the appointment goes and make best use of the resources available i.e. your consultant’s time, experience and advice. At that point it struck me that going into the appointment I had a very clear idea of the outcome I was expecting and of the information/areas/risk factors we needed to discuss to arrive at that conclusion. 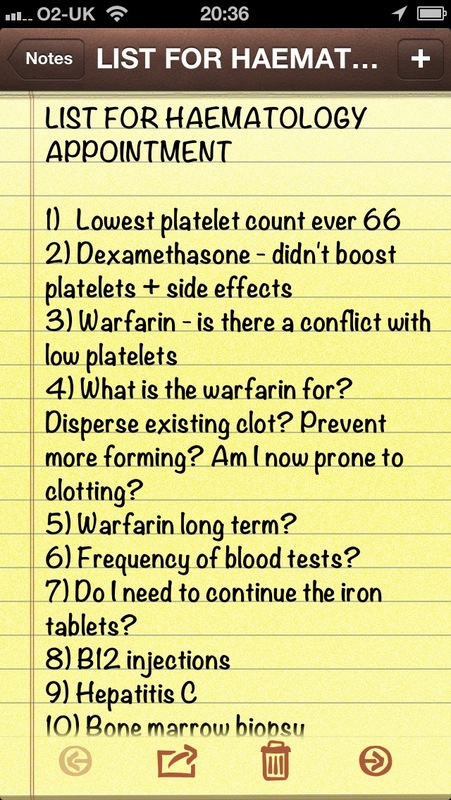 (The decision on whether to start Warfarin or not). Clearly my issue wasn’t with the new doctor, as he had simply referred to the latest notes, so I asked to see the Head of Department. I knew this would never happen, but at least it had the effect of getting the appointment back on track with the appearance of one of the senior consultants. She had been a party to reviewing my case at a recent MDM (multi-disciplinary meeting). I ended up with the decision I had been wanting.